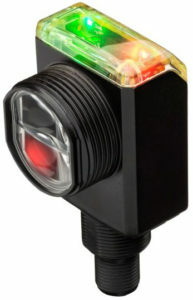 The new Allen-Bradley 42AF RightSight M30 photoelectric sensor from Rockwell Automation is the latest addition to the smart sensing portfolio. Built with improved environmental resistance and long-distance detection in a mid-sized, right-angle housing, this smart sensor offers the flexibility and performance required for a wide range of high-demand applications. The new photoelectric sensor was developed to help increase reliability in harsh environments where dirt or undesired particles could accumulate on the sensor lens. Built with IO-Link capability, the sensor easily integrates into the Connected Enterprise by delivering data and diagnostics from the sensor directly into a control system, to help minimise downtime and increase productivity. With this capability, the sensor provides information such as signal strength, location, proximity alarms and timing functions that help create operational efficiencies and streamline troubleshooting. The 360° high visibility LED power and status indicators further assist in setup, monitoring and troubleshooting.